On Wednesday, Sarah was the very first person to use our very own personal key to unlock our very own personal house. 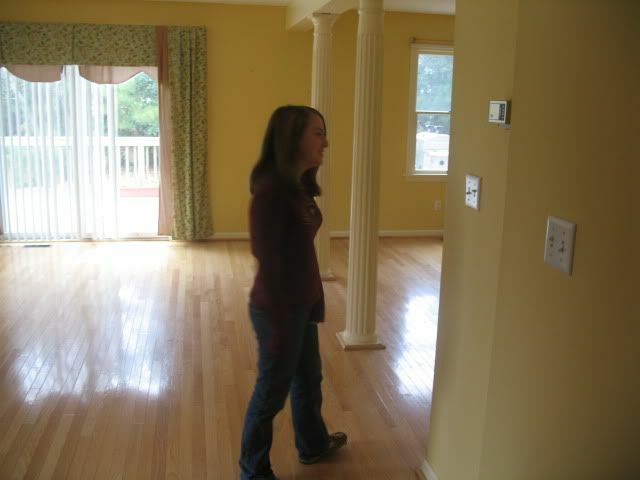 We then took the new house tour. 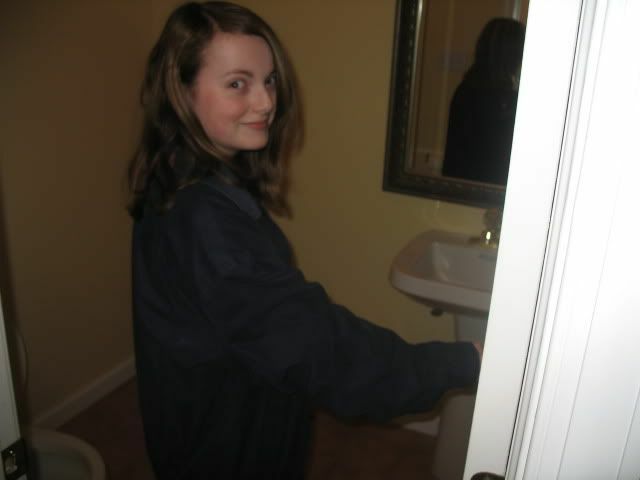 After awhile, Sarah informed that she was going to be the first person to use the bathroom in the new house. I said, "Would you like me to take a picture?" This is the look I got. So with all that stuff to deal with, why is this woman smiling? I was smiling because it was still early in the day and I wasn't yet in a box-befuddled state of mind. The befuddlement is starting to settle in. 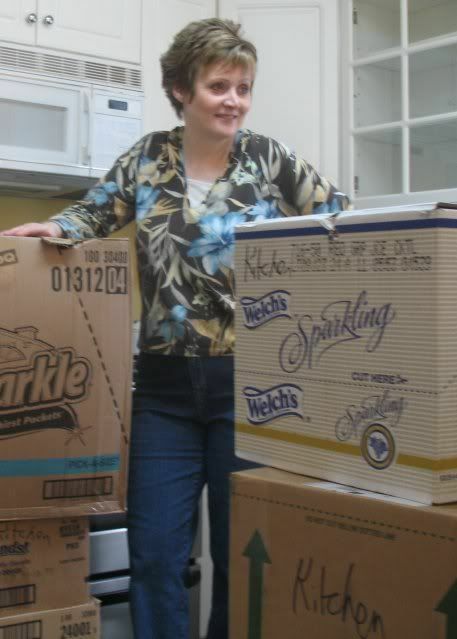 And then I stopped smiling altogether shortly after I took a long look at all the boxes and more boxes. And more boxes. And more and more boxes. Have I made myself clear that were a lot of boxes? Because there were. A lot of boxes. A lot of lot of boxes. The boxes overwhelmed both sides of my small brain. Oh look! More boxes! May I go lie down now? 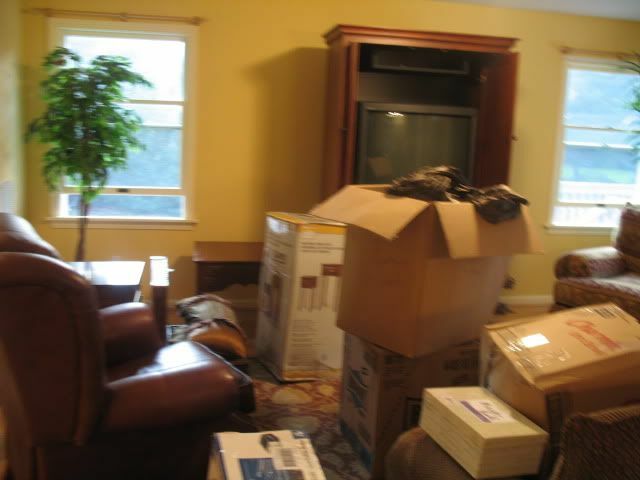 And even when there were no boxes readily visible, there was still Stuff To Be Done. Oh my aching back. Oh my aching brain. About halfway through the day, the three Big Mover Guys realized that Nathan's queen sized box spring would not go up the stairs. (The stairs turn halfway up so it's a bit of a tight fit.) Steve's and my king sized bed went up for reasons I don't (as a woman) readily understand. Something about the king sized bed bending? I really don't know. I'm still zoned out in Box World and cannot think clearly about most things. The Three Big Mover Guys pondered the immovable box spring conundrum for quite some time and finally came up with . . . well, not much. One guy said he and his partner have been moving furniture for eight years and had never before come up against this sort of problem. Enter my husband. The man who thinks outside the box as a matter of course. He came up with a plan (which of course my box-befogged brain does not understand) having to do with taking the box spring partially apart so that it could bend more. And it made it with less than 1/4 inch to spare! 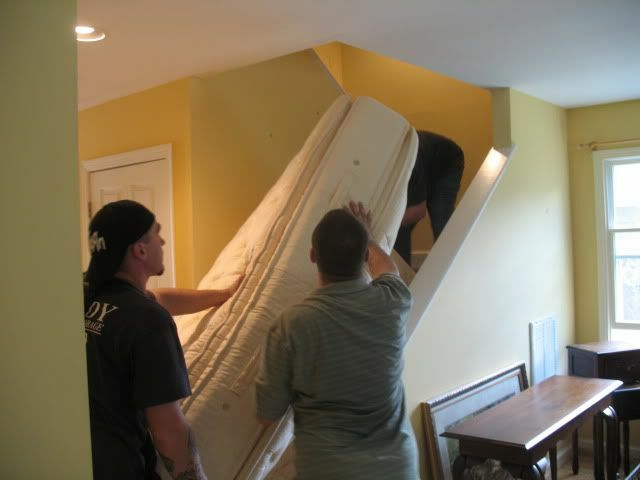 In this picture, I do realize the guys are carrying a mattress and not a box spring upstairs but it was the only picture I could come up with. When Steve wasn't busy reconfiguring box springs, he launched into the scrubbing of the floor. The place where our washer and dryer was supposed to go was quite dirty and since we had no mop (and since I can't get on the floor without having to have a crane come in to get me back up) Steve spent twenty minutes cleaning the floor the old fashioned way. Is he a keeper, or what? As it is, we can rest in a chaos-less place and then attack the boxes in a refreshed state every morning. In fact, we're going to be heading over there again today in a few minutes and will probably spend 10 or 12 hours working. I'd better have lots of chocolate to keep my spirits up! 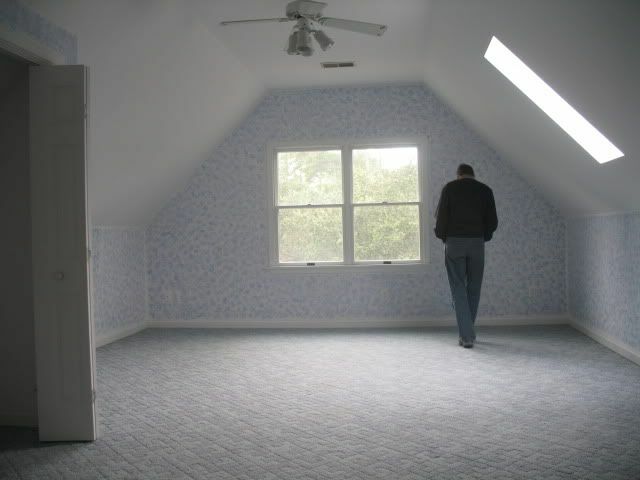 So in the meantime, we'll just move in and close our eyes to the very scratched walls and the very worn out carpet. And then when each small improvement comes along, we'll just appreciate it all the more! And speaking of appreciating something, on Wednesday after the three of us had spent several hours at the house unloading our two vehicles and putting stuff away, we went back to our borrowed cottage to try to muster up enough energy to fix something for a late lunch. Suddenly, there was a knock on the door and two ladies from the church walked in bearing an entire meal! Hurray! And then last night after our very long day of moving, another family in the church brought homemade beef stew, rice, homemade bread and a made-from- scratch chocolate meringue pie. The three of us gulped that meal down as though we hadn't eaten in days. It was exactly the right kind of food to eat at the end of an exhausting day--delicious, comfort food. The family also brought two other meals to eat later on when we don't have time (or energy) to cook. We are just overwhelmed by such thoughtfulness and generosity. It is quite a privilege to be putting down roots here in Manteo and every box we unload digs the roots a little deeper. I see the first thing you unpacked in the kitchen was the coffee maker! LOL I'm not a coffee drinker myself (Coke Zero is my drink of choice), I still find that funny. And then I noticed Sara's school supply box. I think she's probably getting alot of "out of the box" learning done when adding up her dad's footsteps to calculate room size and dividing box spring width to get Nate's bed up! Hope you have another productive day! I got all teared up, too, by the end of your post....Eastern Carolina people are the best! I hope you will love it in Manteo! My friend and I have always said that we may just retire there...close enough to Hatteras but easy to get away when the hurricanes come! Can't wait to see more pictures as you "Smithify" your new home! Wow! 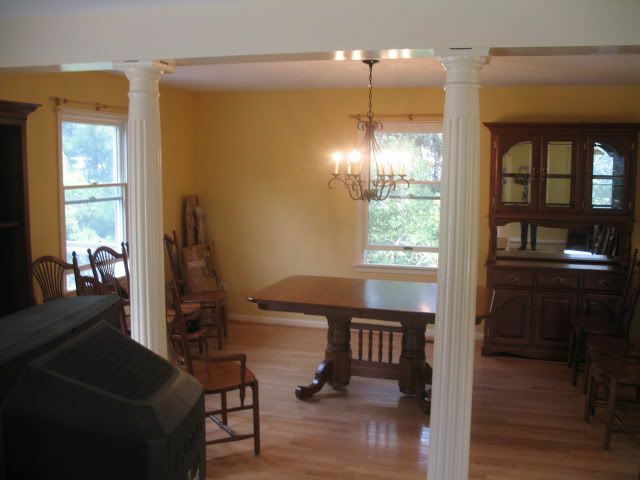 your new home already looks lovely with your furnishings in place. Can't wait to see more photos when all the boxes have been unpacked. stew and homemade chocolate pie: yappee dappy doo! Your new home looks so pretty. It looks just so comfortable...at least it will once all those BOXES get unpacked! I am so happy that everything has gone well...so far! What a great bunch of people you have in your church. So thoughtful...they are wonderful people with wonderful hearts! I pray that you all make some great memories in your new home. WISH I were there to bring you comfort food including bread and jam. But I will NOT send you a BOX of anything right now! Best wishes for reducing the chaos and settling into your wonderful new home. 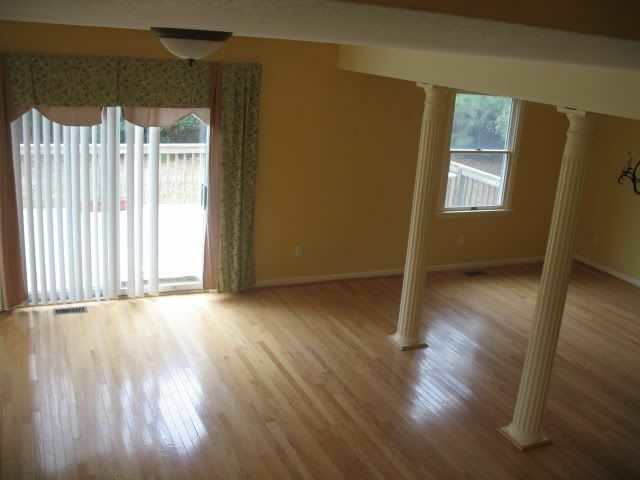 Glad you took the wonderful "empty house" pictures--the light was beautiful. I love Sarah's room especially. Now, do consider that I can be Sarah's science homeschool buddy by e-mail. My whole job is having fun with science, and I'm glad to suggest, advise, encourage, answer questions, pose questions, etc. Click on my name to check out Science Outside the Box's website. I also have a personal Facebook page and a fan page for the business. I started this business in 2003 after I lost a beloved job in science outreach for a museum AND was diagnosed with chronic leukemia. 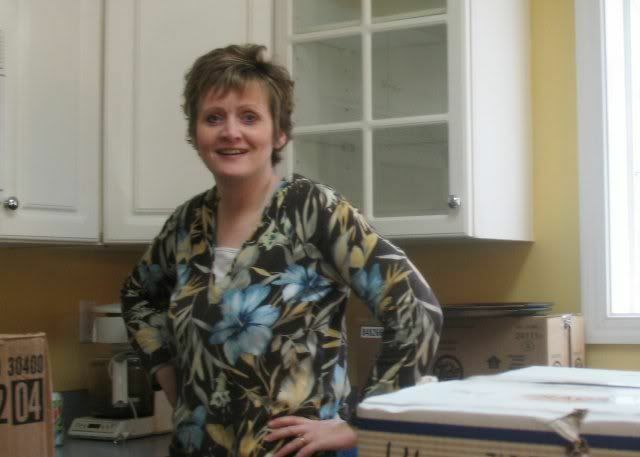 I "met" you through Caringbridge's wonderful resources. 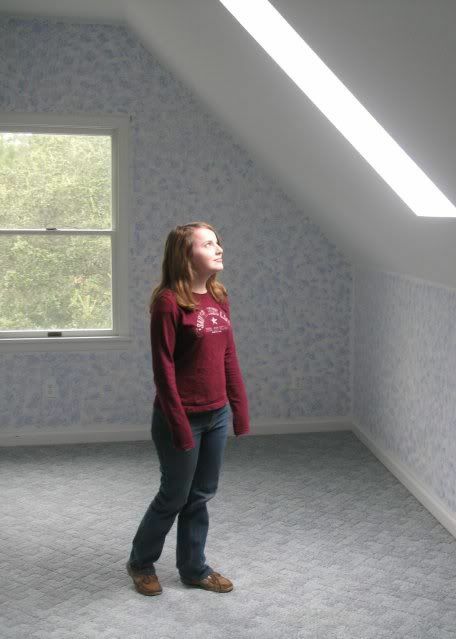 I love Sarah's room and what an awesome picture of her looking up through the skylight. 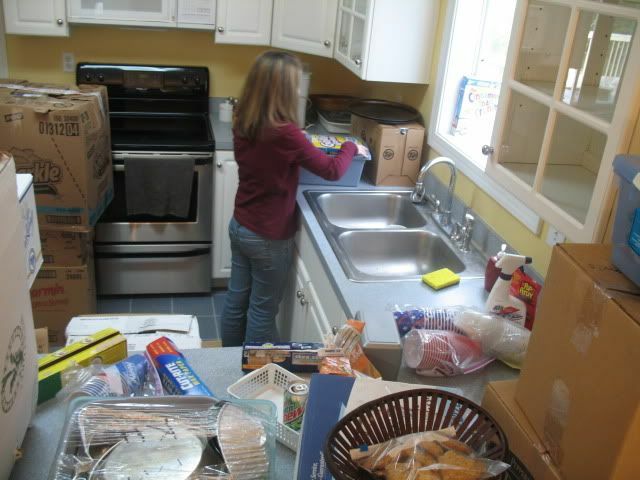 I have always found unpacking much more enjoyable because you can see progress with each box you crush! Can't wait for more pictures. King bed went upstairs because the box spring is two pieces. Queen box spring isn't. We recently had a similar problem at our house. We were eventually able to get the box spring upstairs in one piece. Good luck with your unpacking. becky what new address to your new house? 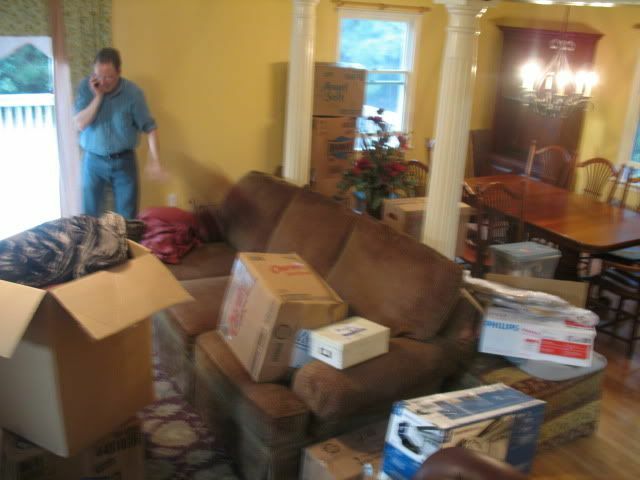 When we moved a sofa that had made it down the stairs could not make it back up the stairs. 1 hour of movers trying, trying, and trying again. They were determined but in the end the couch won, well actually lost because it's leg's had to be cut off and then reattached in the new house. 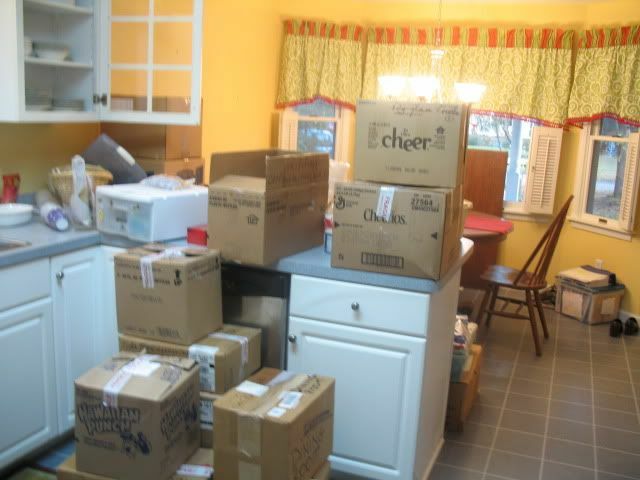 Your home looks beautiful and once the boxes have cleared it will be a home. Enjoy! welcome to our corner of the world. Let us know if there's anything you need. Kinda reminds me of the "Mitford Series", with Father Tim and all of the wonderful folks of Mitford. This is going to be such a wonderful time in your lives -- I just know it!